When Archway Young Offenders Institution is closed down a notebook is found in one of the rooms. "I have to start by saying that this isn't an apology. I'm not sorry. I'm not"
"They say I'm evil and everyone believes it. Including you. But you don't know." It's pages reveal the dark and troubled mind of Emily Koll, Archway's most notorious inmate. "Sometimes I wonder if I'll just carry them around with me forever like a bunch of red balloons. I received this book for Christmas last year, and had finished it by Boxing Day! It's a book that I would happily read over & over again! 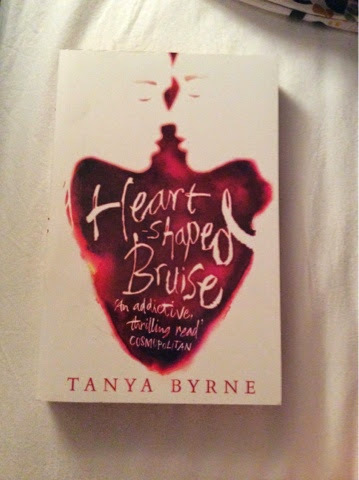 Heart Shaped Bruise is absolutely brilliant and so well written. The story line is clever, addicting and thrilling all at once. Emily Koll writes about how she came to be in the young offenders institution and what life is like inside. Even though Emily is the antagonist in the book, I can't quite help but really like her. Her dry sense of humour and view on life is quite intriguing making her some what rather likeable! Tanya Byrne gives us an insight into Emily's mind, relationships, opinions and what life was like before conviction. I would highly recommend this to anyone and everyone! I'm looking forward to reading Tanya Byrne's most recent book! Aoife has read 1 book toward her goal of 30 books. Open days & stationary hoarding! Header by Denise Bentulan. All images and contents © Muffled Murmurs 2013 - 2014 unless stated. Powered by Blogger.